If you are detained by law enforcement, do they have the right to search your digital property? This question has been answered yes – in some capacity. Today, a U.S. federal appeals court ruled that police officers could search through a suspect’s cell phone to obtain numbers without a warrant. The case stems from a drug bust in Indiana. After the suspects were apprehended, police searched cell phones recovered from the scene and used the numbers to take down a drug ring. The judges on the appeal court panel determined that this action was akin to getting address and phone numbers from a pocket diary, but cautioned that any other type of warrantless search of electronic devices would cross the line. While the overall issue cannot be answered with this one case, this is definitely an important issue to keep on the radar and just one more reason to password protect your devices. Hmmm, I don't understand why people are so paranoid about things like this, unless you broken the law or something what is it that you have to hide. I wouldn't hand over my phone if I was pulled over for forgetting to use my blinker, but..... if I was caught selling .... you know, ha I wouldn't be surprised if a cop wanted to see who I'd been texting. That's why it's useful to have the History Eraser app's widget on your homescreen. It deletes all calls, SMSes, and browser history in an instant. Really, jamrockjones ??? I guess you dont like having constitutional rights,do you? This could be used as precedent to search your hard drive,laptop,or whatever else you might have on your person,without any reason whatsoever just with the intent to find something to incriminate you. That's a horrible excuse. Not every who wants privacy is doing something wrong. Not to mention, that is a very slippery slope. Maybe we should have to voluntarily submit to warrantless searches of cars at checkpoints every morning? Afterall, if you're not doing anything wrong you have nothing to worry about, right? dude it's that type of apathy that will ruin a great nation.... Even if you were selling, he should still need a warrant to search your personal property. It is important to me because during Occupy Wall Street police would take phones from people and delete videos that were made of unsavory treatment by police towards citizens. Luckily a lot of video still made it out, but giving police authority to go through one's phone without a warrant is a slippery slope. And even if one does not care about Occupy Wall Street, there have been other times where police try to take phones and cameras to delete pictures/videos. Even though I can not remember ever breaking any laws, I do not want police going through my phone. Why is that police officer so muscular and shiny? To turn you on...did it work??? It's simple really, I keep my locked, if they want to go thru it, so me a warrent and I will gladly unlock it for them and let them do it. The reason people make such a big deal over this is because they don't want strangers seeing personal things like oh maybe a naughty pic of their wife, this is also why ii disagreed with the new law that was passed here in indiana, which allows cops to enter a residence if they want to, I know I'm not doing anything illegal, but I don't let people I do not know in my home around my family and I don't think it makes a damn bit of difference if that person is wearing a badge. Holy Crap are you serious? They can do that? Oh hell no, that is not going to be allowed to spread. This sort of crap is just a way to bring that police state of law practices to fruition. How can you expect citizens to feel at ease and safe when police can enter your home if they feel inclined to? This is interesting, I must read up on this. I think this law needs to be fine tuned a lot more and taken back a bit, unless you are detained for some crime that may have evidence on your phone and before any police officials can even go through it they have to obtain a court order to go through the phone, but I see no problem with them taking the phone and holding it as a material witness( lol). LOL...I know that cop in the pic. Yeah he's the local cop that can bend qaurters, and bench over 800 lbs. Just another way for cops that don't have a good reason to harass you to find one! Police can do anything as long as they have "probable cause." I used to be a bad kid when I was younger, like 19 or 20. Police would pull us over and search anyone and everything and give the excuse that the car matched a description of a vehicle used in a burglary, which was total BS. So, they can make up anything and call it "probable cause." But as far as the phone search and seizure thing goes.... I feel smartphones should be considered computers more than phones. They're more computers that can make calls than phones being computers. 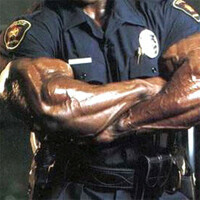 5. k1ng617 posted on 24 hours ago Why is that police officer so muscular and shiny? ......a guy slapped the cop, stole his creatine and made his get away thru a vegatable oil factory right before this photoshoot. "Those who surrender freedom for security will not have, nor do they deserve, either one. " - Thomas Jefferson This is a slope we have been on in the United States for a while, but it. Really. Accelerated after 9/11 and The Patriot Act. Dangerous stuff.